Biji always got up in the dark before dawn, quickly wrapping a simple cotton sari round her–the front hiked up to cover her ample belly. She’d tuck in the loose end at the waist, out of her way. In the kitchen she’d light the single gas burner to boil the water for bed tea. Everyone in her family took their bath before breakfast. And before they took their bath, they liked a cup of hot tea with milk and sugar. By seven or eight, everyone ate breakfast. Husband, sons and daughters still living at home, visiting sons and daughters-in-law, grandchildren. Omelet, toast, parathas (homemade fried whole wheat flat breads), more tea. 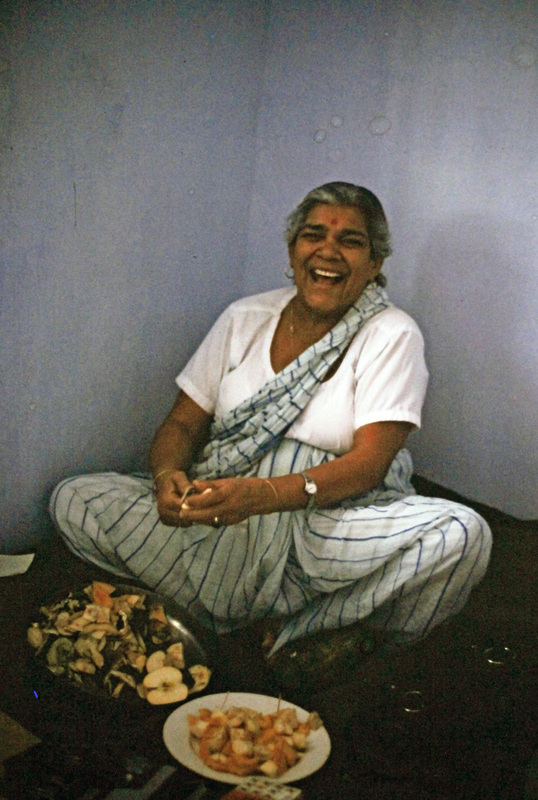 Biji would prepare it all in her simple kitchen, sitting on a stool only inches high, close to the concrete floor. She had only two burners, one gas, one charcoal. She didn’t own a western style stove or cupboards. She stored all her ingredients, pans, and tools near her on low shelves or in containers on the floor. She kept her few spices in a masala dabba–an old wooden box divided into compartments, one for each spice. She didn’t have a refrigerator: every day someone would shop for fresh vegetables, fruit and meat from the bazaar. By about one p.m., everyone was ready for a big midday meal. Lentils or beans, yogurt, vegetable dishes, maybe rice, maybe meat, always chapatis (another homemade whole wheat flat bread). Everything was made fresh and took a long time to cook. Biji–with help from other women in the house–cooked everything. She worked almost all day long in the kitchen, except for a little rest in the heat of the afternoon. When her daughters or daughters-in-law or friends joined her in that tiny room, they would talk and laugh. She had a deep, hearty laugh that rocked her short, plump body. If she sat outside the kitchen with the family, she would keep busy, perhaps making homemade pasta with her fingers, piece by piece, or setting wedges of salted lemon in the sun to become pickles. Always, it seemed, she was cooking. By four everyone would be ready for afternoon tea with snacks and sweets. Sometimes friends would stop by, ready to be entertained–and fed. By eight, it would be time for dinner, another big meal not so different from lunch. Perhaps she would add a dish or two. She stayed in the kitchen preparing fresh hot chapatis while the men and children ate. Hospitality apparently demanded many complicated dishes that required long cooking times and much attention. Her husband believed that home cooking was best and she vigorously, passionately agreed with him–even though she was the one doing the cooking. Before bed, at ten or so, everyone drank sweet hot milk. Biji cooked and served it. Biji was my mother-in-law. I first met her when I was twenty-one. My new husband Inderjit and I went to India soon after our marriage. He was eager to go home for a visit after years of graduate school. Would I be welcome? His family (and mine) had only reluctantly accepted the idea of our marriage. And what would be expected of me? My father-in-law had suggested that I emulate Biji, a “perfectly submissive wife.” All this made me perfectly nervous. Submissive was not on my self-improvement list. Still, even if the trip turned out to be difficult, at the end of it, I would go home to Canada, and I was excited about travel to an exotic, faraway land. How much harder it must have been for my mother-in-law! Her beloved son went to graduate school in the West and, like so many others, decided not to come home after graduation. Then he had married a Canadian girl. Her grandchildren would grow up far away, speaking a language she didn’t know. Maybe she believed the 1960s Indian stereotypes about Western women, stereotypes based on Western movies. (In those days, relatively few Indians had traveled to or settled in the West.) We were brassy females who drank too much, smoked too much, and were–promiscuous. I could only smile and hope for the best. At my first dinner in Chandigarh, bowls of food were put on the table for everyone to share. But one was placed in front of me and meant for me alone. Biji had heard that Canadians like simple food, not spicy. And we had a particular fancy for potatoes. On my plate was one large potato. Peeled and boiled. Plain. Unseasoned. Cold. I was touched–and depressed. I wanted the spicy, interesting dishes the rest of the family was eating, but I knew the potato was the gift of a generous heart. Biji had wanted to give me something for dinner that I could enjoy. I ate that potato and other food besides. When she saw me eat with gusto the spicy family dishes she served that evening, she must have relaxed: she never served me another plain potato. Too soon, the few weeks of our visit were almost over. In a day or two, we would leave for New Delhi and our flight home. On my last full day in India, Shashi, one of my sisters-in-law, came to talk to me. Shyly she told me that Biji had a request. Shashi told me that when a new bride comes to live with her husband’s family, she isn’t asked to do any chores for thirty days. Those days are meant to give her time to relax and get to know her new family. At the end of those thirty days, she is asked to make a sweet dish. After that, she takes her place as a full-fledged member of the family. Biji wanted me to make dessert. Would I come now to the kitchen? I went. I knew nothing about cooking Indian desserts. Nothing at all. I wasn’t sure how I’d get through this one. In the kitchen, Biji was making halva, a delicious concoction of Cream of Wheat, sugar, butter, and nuts. Biji gave me a spoon and I stirred the pan. Once around. That was enough. She took the spoon from me, smiling broadly and chattering in Punjabi. I didn’t understand anything of what she said. She hugged me. Then she ran into her bedroom. She came back with a gift for me: a lovely rose pink sari. I understood. In the rituals of food and cooking, family ties are created. And a loving, cooking woman can bridge a sea of cultural differences. This entry was posted in storytelling by Margaret French. Bookmark the permalink. I love it, Margaret. I”m glad you posted it. It is good to see it again. You should publish this. Thanks, Marni. And thanks for sticking with me. Nice to be back to work. Yes, sad about Louise. In addition I want to say I find this sooooooo touching. I love the food and the quiet sense of sisterhood you feel with your mother-in-law… Just lovely. You bring such a richness to our “story club”….. The picture is wonderful too. Love the video. Thanks for sharing. And I definitely want to get to know Huldah. Margaret, this is wonderful to read … i feel as though I visited in India with you! Thanks for sharing and keep on writing!! Loved the story and as I cook for people as a way of bringing them in connection with one another and the plant people and had done so for 32 just before I read your story, I was particularly touched. Thank you. Wonderful and loving portrait of your mother-in-law, Margaret. And your children’s grandmother! Such important memory of what is important in life: food, love and acceptance. This is a great story, Mom. Thanks for sharing it. This is such a touching story, and so beautifully written. I don’t often get the chance to read many of the posts on this list, but the subject line “My Indian Mother-in-Law’s gift” caught my eye, as I’ve just finished helping my husband edit a story he wrote about his Mom who died suddenly in September 2012. His is a very different tale — from the perspective of the son who accompanied his Mom on her fieldwork. Though I helped him with his story — I haven’t written anything about my mother-in-law myself. You have now inspired me to do so. Thank you! Thank you Laurie. Good luck on your story! What a recollection. I just loved it. God bless you. We love you. Thanks so much. I love you all too. Hey Margaret. Terrific story. Makes me think about the first time I went Hawaii and met my Chinese mother-in-law. I think that’s what’s best about a story like this. It calls to mind so many others. So true. Every time we tell, people tell us their stories. Love it. So beautifully written Margaret Aunt and very heartwarming! Reminds me of all my memories with Biji. I used to call her that too because that’s what she enjoyed being called. I always looked forward to cooking and eating her food made with love. Beautiful story, Margaret. I’m craving lentils and the hot Indian sun just reading it. Thank you for sharing. Margaret, I ;loved your beautiful writing. You not only painted a very vivid portrait, but you also taught me about Indian culture. Thanks. You too must have stories about culture & food. Thank you, Margaret, for sharing this great piece about family life and how women interact with each other in India. I learned a lot. I appreciate the time you took to encourage me after my recent telling of Snake’s Skin, at Proctor’s. Merry Christmas to you and Jake. I loved the silent understanding about stirring the pot. A great moment! Reading your words conjures up two warm welcoming women…your mother in law and you. I always have a good feeling of contentment when I listen to you tell a story or I read one of your blogs. Thank you for the many kindnesses you bring by being you. Thank you Rita. And the very best to you too. What a lovely story! Beautifully wrought! It made me think of my wife Sandy’s introduction to the Reiser clan – Twelve of us at a Thanksgiving dinner. Dad bellowed and kept filling his plate. Mom kept trying to take away his wine. All of us shouted and drank and argued about politics. My aunt stormed out of the room twice. Sandy was terrified. Her usual Thanksgivings involved four maybe five people quietly chatting about the weather in good Midwestern WASP fashion. Have a merry and magical Holiday! Love the story. I can so relate. Hi Margaret. It’s been a long time since the last posting. Enjoyed (as usual) this short story. Looking forward to seeing you and Jay for New Years. Thanks for this, Margaret! It’s been too long since I’ve seen a story from you. Such a beautiful story . So lovely, so touching and so very nice story. Thanks for sharing amazing dimension of Humanity and Relationship. Thank you, Vinay, for your lovely comment. OMG! This made me cry. I was searching online about what is THE PERFECT gift to give to an Indian mum-in-law and I ended up on your blog. When i read the section about “rest for 30 days, make a sweet dish, stir once” that made me think of my own mum-in-law in India. She’s also sooooo sweet. Can’t wait to go back to Punjab and see her again. I’m so pleased you liked my post. Thank you for sharing your thoughts.